Now these truffles really won’t be everybody’s cup of tea, but I personally rather liked the result of my latest exploits with chocolate. I was pondering what else I could make using peppercorns for this month’s Spice Trail challenge, and the brilliant pairing of strawberries with black pepper came to mind. The problem with that though is it’s not strawberry season. But then I got to thinking that perhaps this is my opportunity to put those freeze-dried strawberry pieces at the back of the cupboard to good use. 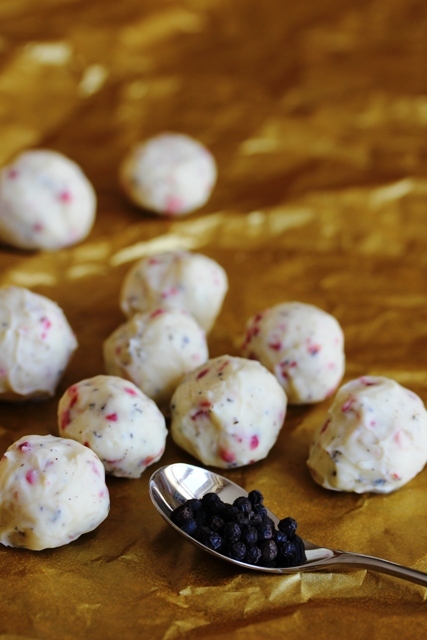 Hey presto, the concept of white chocolate, strawberry and black pepper truffles was born. But the thought process didn’t stop there. It then occurred to me that if you’re using pepper in truffles, then why not go the whole hog and make salty ones too? I made some salted peanut butter and dark chocolate truffles for my husband last year and they were really rather addictive. So, how to use salt again in a truffle? Well, since salted caramel is everywhere at the moment, how could I get that into a truffle. In the form of the splendidly retro Caramac bar, of course! And that’s where the salted dark chocolate and Caramac truffle came from. 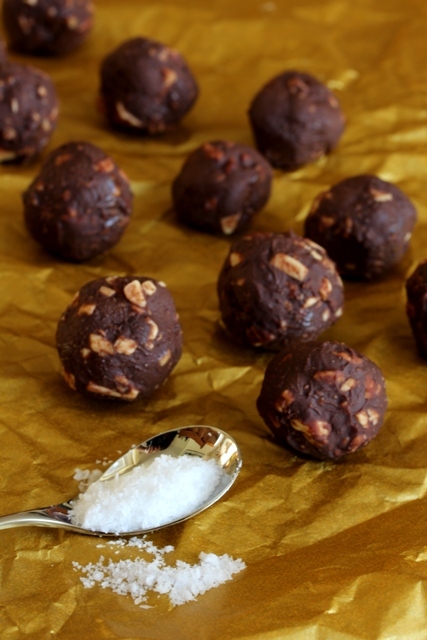 A word of warning though if you do try making these salted truffles: proceed with caution. I was a little heavy-handed with the first batch I made and totally overdid it with the salt. The chocolates were completely inedible. Next time, I was much more wary and sprinkled in just a small pinch at a time, until I achieved just the right level of savoury saltiness. You have been warned! The recipes are adapted from the basic chocolate truffle recipe on the BBC Good Food website. Break up the chocolate and place in a bowl. Gently heat the cream and butter in a saucepan, until the butter melts and the cream starts to simmer. Remove from heat and pour onto the chocolate. Stir it all together until you have a smooth mixture. Add the strawberry pieces and black pepper and mix well. Chill in the fridge for a few hours. To shape the truffles, lightly coat your hands in sunflower oil and roll teaspoonfuls of the mixture to form small balls. You can keep the truffles in the fridge in a sealed container for up to a week or freeze for a month. Leave to cool on the side for half an hour or so, until it’s cool enough to stir in the Caramac pieces without them melting. Mix them in well. Sprinkle in a little crushed sea salt and mix again. Taste and add more if you think it needs it. As before, shape the truffles by lightly coating your hands in sunflower oil and rolling the mixture to form small balls. The truffles will keep in the fridge in a sealed container for up to a week or you can freeze for a month. 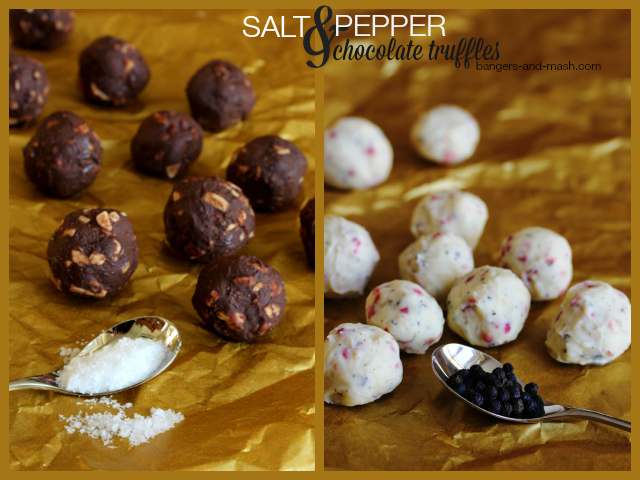 The white chocolate, strawberry and black pepper truffles are my second entry into November’s Spice Trail peppercorn challenge. I really love the sound of these flavours. I made black pepper brownies once which were really great! I usually make gifts at Christmas, must give these a go! Wow gorgeous flavours. I never thought to use peppercorns with sweet dishes, but some peppercorns can be so fragrant and floral. I’ve been eating a salt and pepper chocolate which sounds odd, but is very addictive! 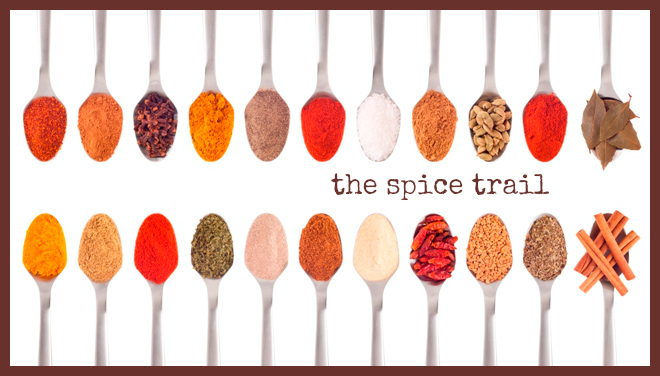 They look great and my kind of flavours!